Do parents wishing for a second child have this dilemma? I finished last year’s gardening season thinking that, for once, I might not need to make new garden beds. Instead, 2008 would mean I would really concentrate on improving that which I have: in particular, in making the newest beds that ring the outside garden (the ones I had made in the fall of ’06) really, truly, happily productive beds. These beds were productive, but they were also the beds in which the most stuff died during August’s rains. Great, I thought: I just need to add a ton of compost, mulch, and more dirt to these beds. Spring is going to be REALLY easy on me. Then, I got the dumb idea brainstorm to build a second greenhouse in ’08. A second greenhouse will keep me gardening year-round: very important for both our diets and also my general happiness. I know that A LOT of work will need to go into my chosen plot of land before this greenhouse can come to be. Remember my trenching/pipe laying venture last fall? That was only 120 linear feet of trench, through hardpan clay. Before I start up this new greenhouse, I will need to trench up and lay another 250′ of drainpipe! Eeeps! Then there’re the new beds that will need to be built and filled. I think (but haven’t decided yet) that the new greenhouse will be 16′ wide x 32′ long. BIG, in other words. So a 16×32 greenhouse would have ten beds in it that are 6×3, and four beds that are 6×4…7 beds on either side of a 30″ center path. (The current 16×20 greenhouse has (8) 6×3 beds and one 2×16 herb garden.) Again, BIG. Then I have to assemble and erect the greenhouse. And of course, with the exception of putting up the greenhouse, you KNOW who gets to do all this work, right? ME! Notice I haven’t mentioned planting these beds, nor planting and caring for the existing garden. I also haven’t mentioned that new orchard which needs to be laid out and planted. Nor the meat chickens that need to have mobile coops made for them. Nor the kitchen renovation, nor the other dozen or so house-related projects that I think need to be done this year, like the outdoor bread oven. That’s, like, a high priority. So, well, I think a second greenhouse will temper my manifest-destiny garden holdings, at least for a little while. But to find the time to do it, I might need to quit my job first. Quit your job? I know you’re serious. 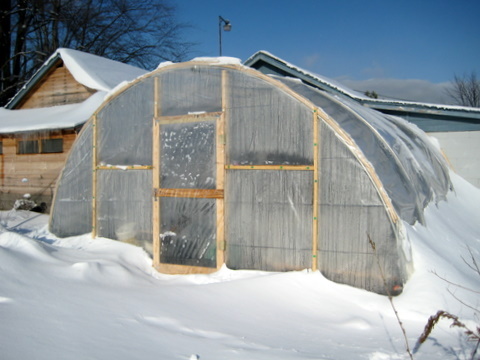 BTW, the only problem with winter (for you, not me; craving summer I am) is that you can’t put up the new greenhouse yet. That bread oven sounds great! What type of oven do you have in mind? CC: That’s why winter is great. My mind goes a mile a minute, but I can’t lift a shovel unless it’s a snow shovel. Kelly: I’ve got a scheme in mind that’s a combo cob oven and something out of The Bread Builder’s Handbook. My husband and I are having serious debates where to put it as my preferred location seems to be messing with his “chi” of the back and side yards. Considering I am the one who’ll design and use it, you’d think I’d rule, but no. Ah. Ahh, you cite the very same reason our oven has not been built yet, even though I own a cement mixer and we have most of the brick we need. I think we’ve reached a settlement, though. Ali: Hah! I often think how smoothly things would go if I were simply a (benevolent) dictator, especially on design matters. But even I don’t have a cement mixer (isn’t that what a wheelbarrow and hoe are for?) so I will say you are really lots further along than me on that score. Good luck working out a compromise, and please blog about the building process! Wow! Just found your site – I’m a fellow Michigander (A2 now; used to be Kzoo) and into growing my own and eating locally. I’m giddy about finding someone with greenhouse experience in my exact climate! With greenhouses (or just a hoophouse in my instance), it’s not thermal mass you’re after. It’s sun. That things don’t freeze in there in my climate (I’m on the lake so I’m a lot warmer than you guys) means I have a pretty broad range of things to grow. Go read Eliot Coleman’s book about a 4-season harvest and use it as a springboard for lots of ideas. With most folks, I say think small first, like doing a simple coldframe or two. Not everyone needs to be nuts like me! I’m interested in checking out your site. Go check my tabs above for some Michigan sources: there’s a grain mill in Eaton Rapids you might be interested in! Hi, El! Yes, your resources are fabulous, and I will be checking out the Eaton Rapids mill and your soy oil source. The ones I know of are Westwind Milling and Thumb Oilseed Producers. I’m a bit fan of Coleman, and I have a full compliment of cold frames. They aren’t doing much for me, though. I now only put up one a year, and sometimes not even that. It doesn’t actually help crops get to harvest size any earlier in the spring – I’ve done side-by-side comparisons. Not sure if that’s the fault of the cold frame design (air leaks?) or what. And fall crops are far too large to fit in the CF, so they don’t extend the season on that end. So I’m interested to see that you actually get usable veg from your greenhouse! Hah espringf! You’re basically spelling out why I never went with coldframes. I’m so glad I didn’t waste my time. I will tell you though that, with a bit more planning, I would be getting more stuff out of the greenhouse than I am now, but…veggies-wise, I’m now pulling the following out of it every week: parsnips, scorzonera, salsify, kohlrabi, beets and carrots; I have loads of leeks in there (and out in the garden too), as well as some very precious and nearly-ready-to-harvest cut-and-come-again broccoli. And then all the salad stuff. It’s pretty packed in there, so that’s why I want the new greenhouse, where I can do whole beds of broccoli and cabbages, root crops and more SALADS!